A Look of One's Own: It can be Christmas every day! Well, especially if you're me and forget about what you ordered. So, the Couture Vintage by Tonje Thoresen (in French!) was a nice surprise. And they all look so wonderful! 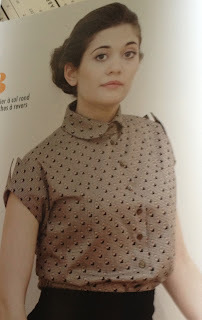 The Couture Sewing Techniques by Claire B. Shaeffer is a technique book, no patterns there, I've just been drooling for it for a long time. I bought it together with Gertie's New Book for Better Sewing (Check out Gertie's blog also) which actually mentions my old sewing book that I got from my mother (it's from the 80s, but awesome) and you can actually still find it in English (Reader's Digest Complet Guide to Sewing). The one thing I love about the Finnish version is that the name is "The Great Sewing Book - Sew and Save". Yes, saving has been a big thing in Finnish sewing at least in the 80s. Well, I know my sister also makes a lot of clothes for her girls and saves up a lot. The best sewing book ever, and better yet: in Finnish! I mean how perfect are these!? Well, it does help, that the model is awfully pretty, but that's the beauty about sewing: you can actually make these fit you, and if they fit, they'll look great. And something about this book and also the Réglisse pattern that I got today (I'll be off to make a muslin after I write this): the patterns are on a thick paper, so they will be easier to preserve! I think this might be a European thing (I might be wrong), because before Colette patterns I had never seen the thin pattern paper. Of course I will transfer these to such paper, but the originals will be intact! The book uses the same technique as many pattern magazines: you have a bunch of patterns on top of each other to save space. This just makes me so happy! 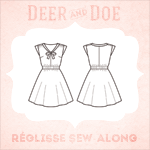 And the Deer and Doe patterns have the instruction booklet both in French and in English (so there's really no excuse not to order these patterns). But if you like vintage style, I really recommend the Couture Vintage book. It's only in French (I think, I didn't really search for it), but I think the pictures are pretty clear and you can always look up techniques on a book in your language. Plus you might learn a bit of French :) And the clothes just look SO pretty! Juuri näin... mutta siis mähän en ainakaan säästä, kun ostin juuri sen sovitusnukenkin :) Mutta mä ompelenkin saadakseni vaatteita, joita haluan, en säästääkseni.